LADIES GLAMOROUS LONG BLACK BALLGOWN MAXI DRESS SIZE 16. IT'S MADE FROM A LOVELY QUALITY SOFT MATERIAL IN A VERY ELEGANT STYLE AND IS FULLY LINED ♥. Reiss Ladies Blue Silk Dress Size 8. Retailed at £240 Waist sits low in a drop waist style Condition is Used only been worn once overall in excellent condition only 1 mark which will come out when dry cleaned. Dispatched with Royal Mail 2nd Class. Reiss Ladies Blue Silk Dress Size 8. Retailed at £240 Waist sits low in a drop waist style Condition is Used only been worn once overall in excellent condition only 1 mark which will come out when dry cleaned. Dispatched with Royal Mail 1st Class. Beautiful Monsoon dress, bridesmaid/communion/party. Size - age 8 years. Laundered so ready to wear. Vera Wang Stunning Red Evening Dress. 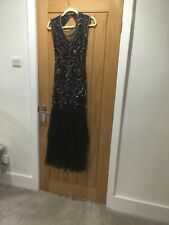 I bought this beautiful dress on eBay, it is stunning but unfortunately it is just too small so it has not been worn by me, Dispatched with Royal Mail 2nd class signed for. DAMSEL IN A DRESS black long evening dress -BNWT - UK16. Gorgeous understated dress - the photos don't do it justice! Look stunning in this red polyester straight cut dress with open front detail. This dress is perfect for special occasions. Beautiful dress with sheer overlay. Dress is fully lined. All sizes are stated in UK Ladies sizing. I can provide more pictures if necessary. NWOT Warehouse 'Spotlight' Racer Back Asymmetric Knot Front Maxi Dress, Size 16. The back of the dress features an exposed zip (as per picture 3) running down the centre of the racer back. This item could be worn to any special occasion by simply adding jewellery and a pair of towering heels. This is a gorgeous Berkertex size16 evening dress. It has a scoop neck at the front and back. The front has an appliqued sequin design and the back has random sequins and is fully lined and washable. Beautifully stylish silk dress by Marilyn Anselm for Hobbs. A love-in with all things beautiful and nostalgic,Jarlo Petite is a collection of floor-sweeping maxi dresses, pretty tea dresses and retro shift dresses, all perfectly downsized for girls 5'3"/1.60m and under. Gorgeous Maxi Dress by Asos New with Tags. The dress has a tiny dot possible from a byro. But it is not obvious. Hence the Selling price . otherwise excellent condition . Size 6Uk ,EU34,US2 Features High neck with buttons closure the back of neck. Open exposed back down to the waist Long sleeves cold shoulders Ruffles style. Zip back of skirt closure. Long back fishtail style measures at 60" long from neck to hem. Front is measure at 38" from neck to hem. Fabulous little dress for prom birthdays Baby shower.aby occasions of your choice. Kindly view pics. Any questions please ask before purchase. I will get back to you. Thank you for viewing and purchase.